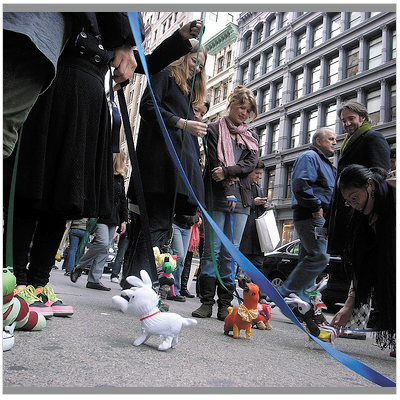 Last Saturday, I spent an afternoon at Gallery Hanahou in Soho, NYC, making a hand-sewn mechanical dog. A small group made up of designers and inexperienced people like me gathered around a long table in the gallery space and, surrounded by the exhibited artwork of Ossu Shugeibu, a Japanese crafting club, we set about "skinning" the poor furry toy dogs whose moving skeletons would serve as the foundation for our own creations. This sounds awful but is actually a terrific way to bypass the daunting gadgetry challenges of creating a mechanical toy and just move into the creative aesthetics of the process. 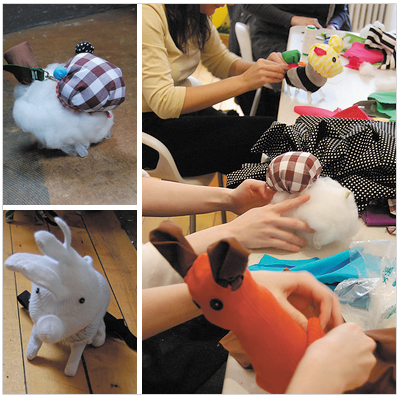 By the end of the workshop, the group of us (some of whom had truly limited sewing skills) had turned out an eclectic array of dogs and dog hybrids with parti-colored appendages (a few proudly bore limbs constructed of men's plaid boxer shorts). We marched them down to the front of the gallery building and took them for a short walk on the street. You can click here for more pictures (photos via Gallery Hanahou). So cute! Rooster dog is my heart! New York is looking cold. So lucky to have this animal to warm up!